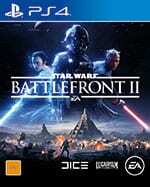 Just over a week ago the lid was lifted on Star Wars Battlefront II, with EA officially revealing it to the world at the Star Wars Celebration in Orlando. Developed by DICE and two additional studios, Battlefront II needs to make up for the shortcomings of the original. The teams are making a more fleshed out, “boots on the ground” Star Wars experience that fans have been craving since the original Battlefront series over 10 years ago. After digging through all the reveals and interviews from that weekend and knowing what little we know, here are some of the things that we’re looking forward to most in Star Wars Battlefront II. 2015’s Star Wars Battlefront was infamous for its lack of a single player campaign. This frustrated fans who thought it a missed opportunity to further explore other characters, unknown or new, from the original trilogy. Ever since Battlefront II was first teased last year, EA has stated that there will be a single player campaign, and that fans should be excited about it. Not only will it be played as the Empire (a side which is often neglected), it will be set in the thirty year gap between Return of the Jedi and The Force Awakens. The story will be canon, or an official story within the Star Wars universe. The campaign is being developed by Motive Studios (a newer EA-owned studio formed to create Star Wars games and headed by Jade Raymond, former head of Ubisoft Toronto) and is co-written by Walt Williams, who wrote the critically acclaimed Spec Ops: The Line. 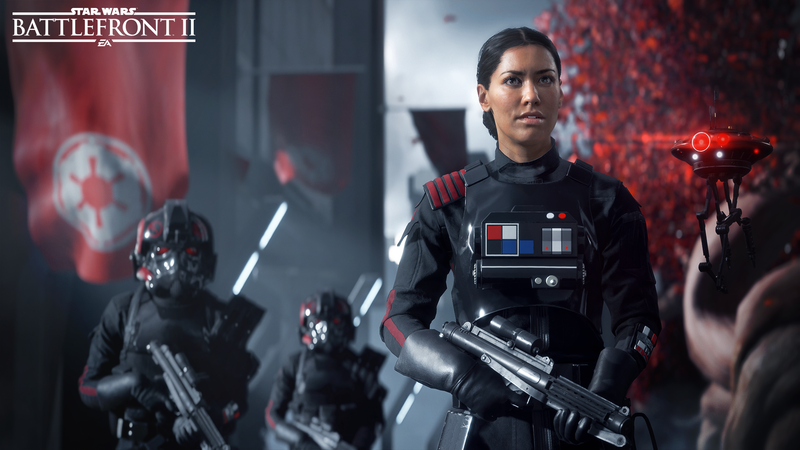 In the campaign, players will assume the role of Iden Versio (played by True Blood’s Janina Gavankar), an elite Imperial Commando who leads Inferno Squadron, a group of TIE Fighter/Commando hybrids for the Empire, with skills in sabotage and infiltration. The campaign starts with the destruction of the second Death Star and chronicles Iden and her squads’ missions over the thirty year period. According to interviews, the story humanises the Empire by introducing characters who have grown up seeing the Empire as a force for good. This will provide a radical perspective on a war rarely seen outside the eyes of the Rebellion or the Sith. The campaign has a new planet called Vardos, an “Imperial Utopia”, where protagonist Iden grew up. Protagonist Iden Versio with Inferno Squadron on Vardos. There will be space battles in the campaign and there may be stealth gameplay as well. Beyond that, there aren’t many more details, including how Motive plans to tell a story that spans thirty years. Hopefully we will get new details soon. Whilst 2015’s Battlefront was not terrible, it felt lacking. It didn’t ease fans’ frustrations when DLC for the game released that “should’ve been included with the game in first place”. But fear not, DICE has been listening to its fans, and the sequel will be a complete game. Battlefront II will span all three eras of the Star Wars films, letting you relive some of the biggest battles in Star Wars cinematic history. This includes those with Darth Maul, Yoda, Rey, Kylo Ren, and other, new heroes and returning favourites. Heroes will be tied to era-appropriate maps, so we won’t be able to run around slicing rebels as Darth Maul on Yavin 4. Instead of the “light” feel heroes had in Battlefront, Battlefront II‘s Heroes will also be weightier, meaning more satisfying melee combat. Battlefront II will offer full classes instead of changeable equipment loadouts, like in the previous entry. Each class will have a shared progression system and will change appearance depending on what map and side you’re playing on. The progression system lets you mould a character as you play to your personal play-style. Vehicles and heroes, and something else that has yet to be revealed, will have their own individual progression systems, letting you add abilities to heroes and upgrade your favourite ships. The sequel veers from the heavily criticised system in the original where heroes, gadgets and vehicles were acquired by picking up floating holograms. Unless you camped on a hologram spawn spot, or happened to be in the right place at the right time, picking up these power-ups was rare. Heroes and vehicles will now work on a ‘resource-based system’. Whilst there will still be some power ups around the battlefield, players will earn in-match currency for performing well that will let them purchase vehicles and heroes. The developers have stated that they want to see multiple heroes running around matches. However, they will be easier to take down. The space battles in Battlefront’s Death Star DLC were existing vehicle modes taking place outside the Death Star, but in this sequel there will be more to them. It has been confirmed that Burnout series’ creator Criterion will bring space battles to life once again in a Star Wars game. Criterion is no stranger to the world of Star Wars space combat. They developed the Star Wars Battlefront: Rogue One: X-Wing VR Mission which released as free DLC to owners of Star Wars Battlefront on PlayStation 4 and PlayStation VR last year. 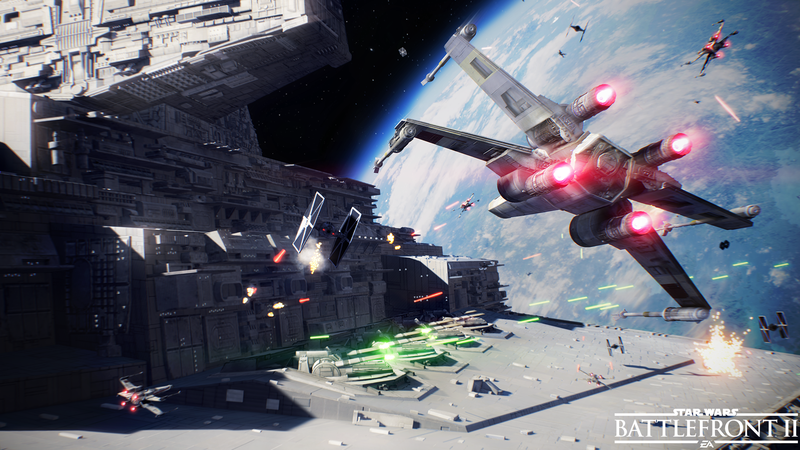 Since we haven’t had dedicated Star Wars space combat since 2005’s Star Wars Battlefront II, having a studio with Criterion’s pedigree handle the space combat means EA wants it done right. 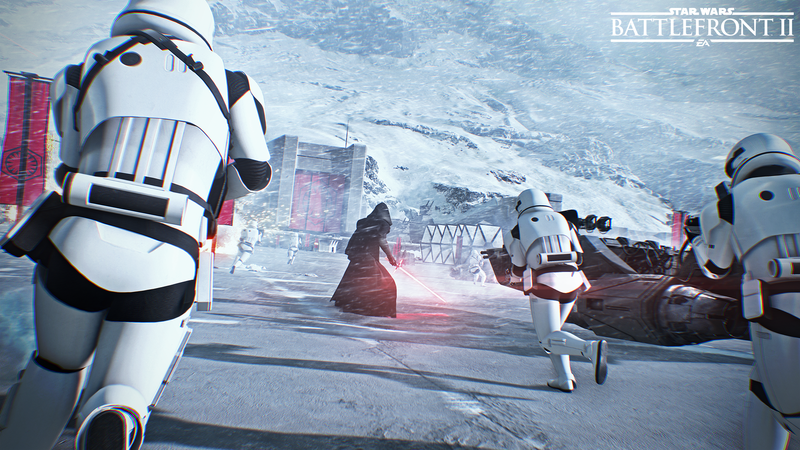 EA also confirmed that Battlefront II will feature full offline split-screen multiplayer co-op on console versions, but not on PC. 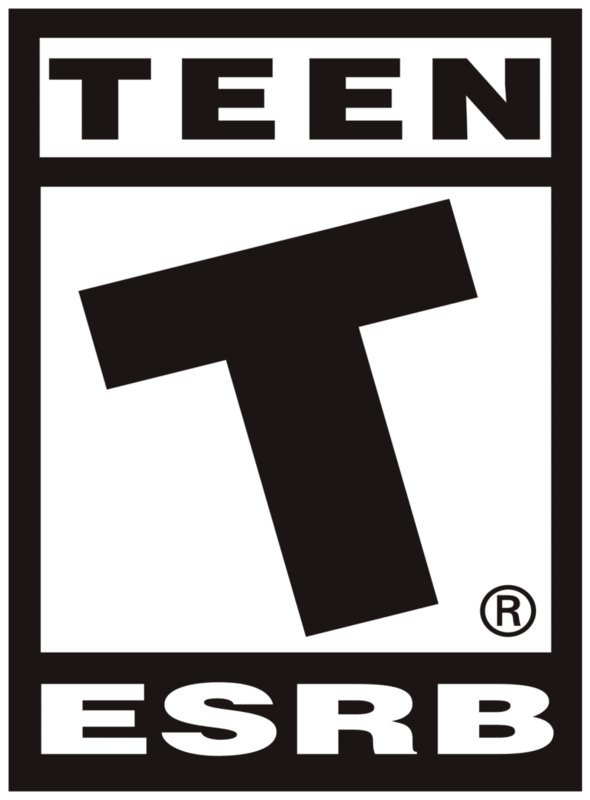 In this mode, upgrades can be earned which will transfer to online multiplayer. This a big step-up from the split-screen co-op in the previous Battlefront, which was limited to the ‘Missions’ game mode (essentially just survival on a couple of smaller maps). For now, this is what we’re looking forward to most in Star Wars Battlefront II. We will no doubt get more details in the coming months, especially with E3 and EA Play (EA’s pre-E3 event) just around the corner. What are you looking forward to most in Battlefront II? Let us know in the comments below.